Crooked McNicol and the Corrupt Compliance Unit Suspends Kevin Higgins for a Poem! There can be fewer things guaranteed to annoy Labour’s incompetent General Secretary, Crooked McNicol, than poking fun at Tony & Cherie. McNicol is not renowned for his sense of humour and taking the p*** out of his hero is guaranteed to make him see red I mean blue. It’s bad enough that that Corbyn fellow got back in, despite Crooked’s best endeavours. To rub salt in the wound by writing so-called humorous poems maligning St. Blair of Basra just has to be a disciplinary offence. Naturally when the overworked Compliance Unit got to work, it was felt that there was no alternative but to suspend the irascible poet in case he wrote any more such poems. Writing poems of this nature brings the Labour Party into disrepute and should be dealt with severely. Unfortunately others poets and that kind of troublemaker seem to have had other ideas and a letter has been circulating with these malcontents names attached. Naturally I deplore this kind of thing and I hope that Crooked has had a pleasant New Year. Kevin’s offence was, apparently, that he had written satirical poems about several of Jeremy Corbyn’s then critics in the Parliamentary Labour Party. This occurred at the start of the unsuccessful attempt to force Corbyn to resign as Leader in the aftermath of the Brexit referendum. After receiving what he describes as a “peculiar series of emails” from UK Labour HQ in early 2017, on March 15th last Kevin wrote to the party’s Governance & Legal Unit informing them that he wished to make a Subject Access Request under current UK Data Protection legislation. Under this legislation the UK Labour Party are legally obliged to disclose to Kevin, within forty days, all documents relating to him in their possession. Nine months later they have yet to respond to Kevin’s request, putting them in clear violation of their legal obligations. 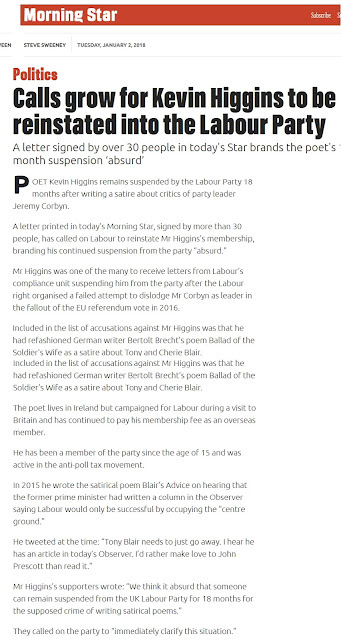 In April UK Labour HQ invited Kevin to be interviewed by telephone about the accusations against him, one of which was announcing on social media that he had rewritten Bertolt Brecht’s poem ‘Ballad of the Soldier’s Wife’ and turned it into a satire on Tony and Cherie Blair. Kevin’s interview was to take place on Tuesday April 18th but was cancelled by UK Labour HQ when Theresa May called a General Election that morning. Kevin has heard nothing from the UK Labour Party since, though he continues to pay his membership fee and campaigned for the party while on holiday in the UK during the General Election campaign in May. 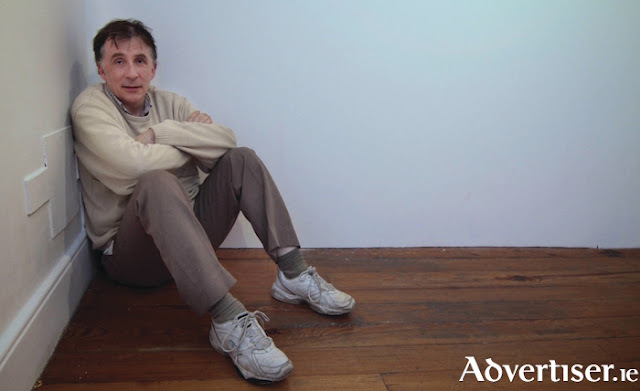 We think it absurd that someone can remain suspended from the UK Labour Party for eighteen months for the supposed crime of writing satirical poems and call on the party’s Legal and Government Unit to immediately clarify this situation. For background to this case see here. UPDATE 3/1/2018 the above letter has been published in today's issue of The Morning Star newspaper and there is also an article about the case which you can read here. UPDATE 4/1/2018 article about the case in this week's Galway Advertiser. UPDATE 5/1/2018 I am interviewed about the case on Broadsheet on the Telly. Apologies for bad sound quality on my link, entirely my fault. I am. in some senses. a technological troglodyte. 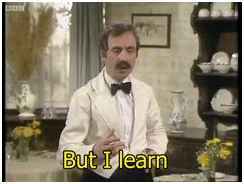 But, in the words of Manuel, "I learn. I learn!"